The Triskelion is the triple-triangle form of fate - three rings were said to invoke the three fates in several ancient traditions. 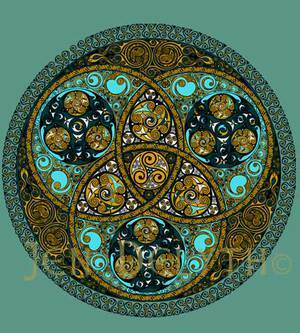 Throughout Celtic mythology and folk tales, Celtic Goddesses appear in triple form, and from ancient times the Great Earth Mother was the Triple Goddess representing her three aspects, Maiden, Mother and Crone. Spirals are the design of nature, of our universe. Snail shells, water flows, star systems - our very DNA is patterned in the sacred spiral thumbprint of life, the Spiral Dance. They are among the most ancient symbols created by our ancestors, carved on bone amulets and cave walls, appearing on megalithic monuments, entrances to caves - sacred places of worship, all over the Continent and the British Isles, such as Newgrange in Ireland, and the Gavrin'is in Brittany. These mystical triple patterns symbolized the womb, death and rebirth, and the coiled serpent or dragon, both regarded as sacred in the old religion, representing the Earth energies.